Totana.net - Registration open to participate in the third edition of the free online self-formative course "Prevention from small"
Registration open to participate in the third edition of the free online self-formative course "Prevention from small"
The Department of Social Welfare informs, through the Municipal Service of Prevention of Drug Addiction, that the Ministry of Health makes available to families in the Region of Murcia the third edition of the free online course for parents entitled "Prevenirdesde pequeños ", aimed at preventing the consumption of alcohol by their children. This training activity is taught online without self-training, in the virtual classroom managed by the Training Department of the FFIS. The course started last September but interested people can be incorporated, with the end date being December 31st. 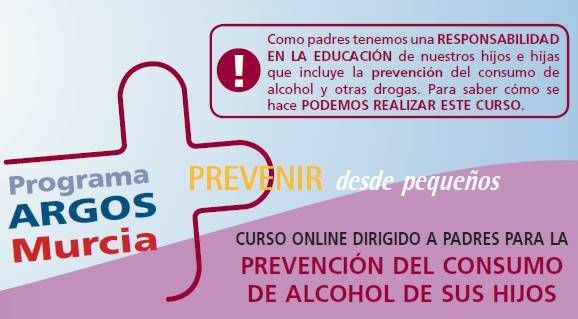 The recipients of the course are fathers and mothers with children of any age, who are interested in trying to avoid the problems caused by the consumption of alcoholic beverages in adolescents and young people, in the same recommendations are offered to help prevention. What do young people know about alcohol? What do we know the parents? The risks of drinking alcohol, do the parents perceive them ?, do the children perceive them? Parents can help their children become aware of these risks and set limits. What does your child think about alcohol? How they influence our children. How household norms and boundaries influence behavior outside. With 4 years ... with 10 years ... with 15 ... How and when to set the rules. THEME 3: Conflicts are positive! Some keys to take advantage of family conflicts. Educate with punishments, anger and resentment or natural consequences? Educate with "emotional blackmail" or with "unconditional love"? On the tightrope: the difficult balance between "control" and "interference". Know what we are talking about, knowledge of ICT. Reconciling family and work life. It seems to be fashionable ... leisure as a reward. As we have fun for parents, that's how our kids will have fun. Learning in leisure time: Extracurricular activities. Sharing leisure time with others: Education in values. Teach them to get bored. Go out with friends in a gang. THEME 5: Families to power! Fathers and mothers in network. "What do I want to change?" happens to be "What do we want to change?" Surveys to adolescents: Some data to reflect.